This print commemorates a performance at the Onishi Theatre in 1828. There are three other prints featuring Asojirō in the Lyon Collection: #s 239, 472 and 1341. 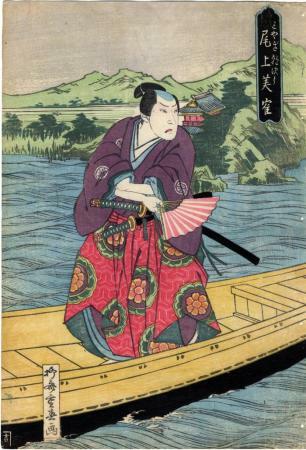 The last one by Tamikuni shows Asojirō standing in a boat. The kanji for the actor Onoe Fujaku is generally 尾上芙雀. Here it is 尾上芙寉, if this is correct. But the last two characters are not found anywhere, so far as we can tell.